Meet Dress Upcycle Challenge Winner Erin Walker! 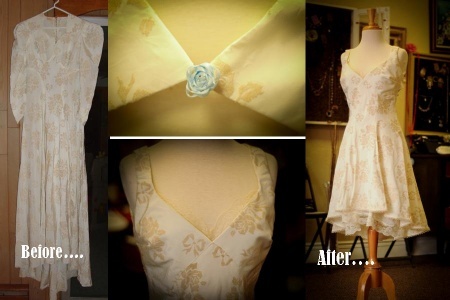 We’d like to introduce Erin Walker, the winner of our Wedding Dress Upcycle Challenge. 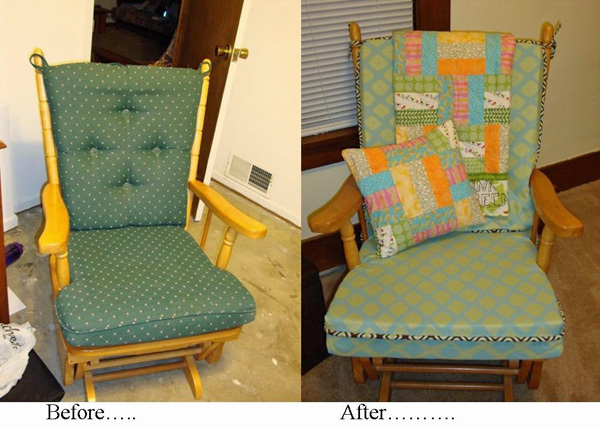 Her story describes her passion for sewing and upcylcling and gives a little insight in her day-to-day life. It’s hard to believe my stroll into Beatnik Betty’s would turn out like this!! This dress is the most beautiful thing I have made in a long time, and it felt good. I always forget how much creating things fills up my cup until I have gone without for a while. With two little ones at home (2 years and 6 months), and trying to get a new business off the ground, once I get down my to-do list – it’s hobbies vs. sleep. Sleep almost always wins – that’s part of what makes completing this project and winning this challenge so incredibly SWEET!! When BERNINA staff talked to me about this post and gave some suggestions that included sharing a picture of my sewing room or other recent projects I have going – I actually laughed out loud. My sewing room consists of an overcrowded and un-organized craft closet, and an old table my 2-year-old uses for crafts in our office/playroom! My current projects are crammed into said closet and let’s just say it’s been a while since they have seen the sun! This contest was a unique opportunity that allowed me to MAKE time to create something! As I thought about what to write I decided in the spirit of the contest I would share other things I have upcycled. 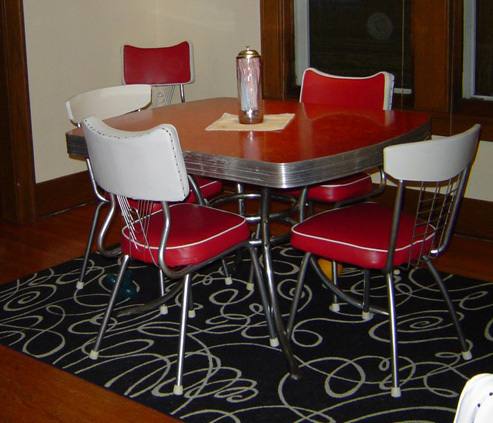 A few years ago we were given a dinette table from my husband’s grandmother. I looked everywhere for chairs but couldn’t find any we could afford that had the retro look. I went to a local thrift shop and purchased six chairs for a dollar each. After a few visits to the craft store picking up supplies I ended up with a beautiful set of chairs to match the table I loved. Even now, Saturday morning pancakes wipe up quite nicely off the red vinyl! The second project was a Christmas present for my niece. I received a box of clothes from a friend that included a rather unfortunate floor length denim skirt. 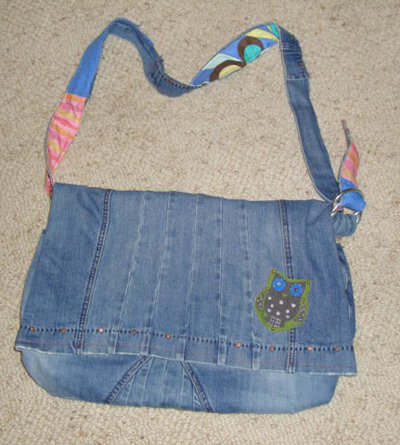 It was ill-fitting and outdated, so with a little upcycling it made a beautiful messenger bag!! The last project I want to share was for my baby’s bedroom. For my first child I really wanted one of those amazing PLUSH gliders with the matching foot stool. I LOVED them – the ones we could afford were uncomfortable and not good quality. The really great ones were WAY too expensive, seeing as we had a new baby on the way. So my in-laws found a good quality rocker at a garage sale and I went to work matching it to the baby’s room. New cushions and covers in just the right colors. I also made her a quilt and matching pillow; you can see them in the picture. It turned out better than I could have ever imagined. It is still as comfortable as the day I finished and it looks beautiful. I love when I walk by her room and she is sitting in it by herself reading to her dolls. Creating things, I am sure like many of you, not only makes me happy, but fills up my soul. Some people like to read, some paint, or jog. I like to take old things that are at or near the end of their life and make them new again. I grew up watching many of the women in my family sew. Most of my favorite things from childhood were handmade. I can remember sitting down in home economics class and making my first pair of shorts. Funny how things change, growing up wearing homemade clothes wasn’t always “cool.” Now it is a source of pride – go figure? This contest was awesome, the staff at BERNINA has been great and I am really looking forward to picking out a new sewing machine! Thank you BERNINA for the opportunity, there were so many amazing entries and I can’t wait to see what the next challenge is. Note: For information on the next BERNINA Challenge – Make Yourself at Home! – click here!